Chicken eyeglasses, also known as chickens specs, chicken goggles, generically as pick guards and under other names, were small eyeglasses made for chickens intended to prevent feather pecking and cannibalism. They differ from blinders as they allowed the bird to see forward whereas blinders do not. One variety used rose-colored lenses as the coloring was thought to prevent a chicken wearing them from recognizing blood on other chickens which may increase the tendency for abnormal injurious behavior. They were mass-produced and sold throughout the United States as early as the beginning of the 20th century. Some versions of the devices had lenses that were semi- or fully transparent whereas others were tinted, often red- or rose-colored. Other designs were blinders which are opaque and completely prevent forward vision. The intended purposes of chicken eyeglasses were to prevent aggressive pecking, cannibalism and feather pecking. Red-tinted lenses were considered to be effective in reducing internecine pecking because they disguise the color of blood. As summed up in a 1953 article in Indiana's National Road Traveler newspaper, "The deep rose-colored plastic lenses make it impossible for the cannibal [chicken] to see blood on the other chickens, although permitting it to see the grain on the ground." Elmer Haas of the National Band & Tag Company, a major producer of rose-colored chicken eyeglasses, whose grandfather had "devised wire frames for chickens in 1902", indicated that he believed the purported blood-masking effect of the rose coloring was a myth: "the firm added the rose colored glasses because it indulged the chicken owners ... [c]hickens are color blind". (In fact, chickens, like other birds, have good color vision.) The firm had added the rose-colored feature to its glasses in 1939 under the brand name "Anti-Pix". This variety of eyeglasses was more complicated than others because the red lenses were fixed to a hinge at the top of the frame. This meant that as the hen lowered its head to feed, the lens swung out giving the hen an unobstructed view of the ground. When the hen raised her head, as she would during aggression, the lens would swing down giving the hen a red tinted perception of the environment. Rose-colored contact lenses, rather than eyeglasses, have also been proposed to reduce cannibalism in chickens. Detail from a 1903 patent filed by Andrew Jackson, Jr.
A form of chicken eyeglasses was first patented in 1903 by Andrew Jackson, Jr. of Munich, Tennessee, as an "Eye-protector for chickens". In the U.S. they were available through the mail order company Sears-Roebuck, or through chicken feed stores for a few cents. The eyeglasses are no longer produced by the National Band & Tag Company, but are sought as collector's items. Using chicken eyeglasses was still practiced in 1973, evident by a report in Illinois' The Hawk-Eye newspaper that a farmer had 8,000 chickens fitted with the rose-colored variety. One inventor of a form of the glasses proposed legislation in Kansas to require all chickens in the state to be fitted with glasses, but his campaign was unsuccessful. On January 16, 1955, Sam Nadler of the National Farm Equipment Company of Brooklyn appeared on CBS' popular primetime television show, What's My Line? The show was in the format of a guessing game, in which a panel attempted to determine the line (occupation) of contestants. Show officials listed Mr. Nadler's occupation for the audience as "sells 'eyeglasses' for chickens". After the panel was unsuccessful in guessing his occupation, Mr. Nadler's identity was revealed and he stated that his company sold 2–3 million pairs of chicken eyeglasses per year. What's My Line? 's director, Frank Heller said in 1958 that the show's "most unusual occupation" over its then eight-season run was "...the gentleman who makes eye glasses for chickens." ^ The use of designs where the septum is pierced is illegal in some jurisdictions on welfare grounds. For example, in the UK's Defra Codes of Recommendations for the Welfare of Livestock: Laying Hens, provides: "The Welfare of Livestock (Prohibited Operations) Regulations 1982 (S.I. 1982 No.1884) prohibits ... the fitting of any appliance which has the object or effect of limiting vision to a bird by a method involving the penetration or other mutilation of the nasal septum." ↑ "Eye Glasses for Chickens" (Fee required). Spirit Lake Beacon. July 15, 1911. p. 10. 1 2 3 "Ask Anne & Nan: Eyeglasses For Chickens" (Fee required). The Indiana Gazette. January 22, 1999. p. 9. 1 2 Gold, Anita (July 18, 1986). "Blinders Make A Spectacle For Chicken-hearted Collectors". Chicago Tribune. ↑ "Lee's Summit Historical Society Museum Glasses for Chickens Unity Village". Freepages.history.rootsweb.ancestry.com. Retrieved 2011-12-06. ↑ "Ask the Gazette" (Fee required). Charleston Gazette. August 11, 1944. p. 6. 1 2 "Company History". Nationalband.com. Retrieved 2011-12-06. 1 2 3 Helsel, Marge (December 17, 1980). "Old Chicks Learn New Tricks" (Fee required). Altoona Mirror. p. 8. ↑ Gentle, M.J.; Hughes, B.O. ; Hubrecht, R.C. (1982). "The effect of beak-trimming on food-intake, feeding behaviour and body weight in adult hens". Applied Animal Ethology. 8: 147–157. doi:10.1016/0304-3762(82)90140-7. ↑ Duncan, I.J.H. ; Slee, G.S. ; Seawright, E.; Breward, J. (1989). "Behavioural consequences of partial beak amputation (beak trimming) in poultry". British Poultry Science. 30: 479–488. doi:10.1080/00071668908417172. ↑ Gentle, M.J.; Hunter, L.N. ; Waddington, D. (1991). "The onset of pain related behaviours following partial beak amputation in the chicken". Neuroscience Letters. 128: 113–116. doi:10.1016/0304-3940(91)90772-l.
↑ Gentle, M.J.; Hughes, B.O. ; Fox, A.; Waddington, D. (1997). "Behavioural and anatomical consequences of two beak trimming methods in 1- and 10-d-old domestic chicks". British Poultry Science. 38: 453–463. doi:10.1080/00071669708418022. ↑ Nussbaum, Lowel (June 25, 1953). "Sunglasses for Chicken Purchased Here" (Fee required). National Road Traveler. p. 5. 1 2 "Fireplug Dog Tags Hit Dust" (Fee required). Journal News. May 15, 1977. p. A-2. ↑ "Advertisement: Glasses for Chickens?". National Band & Tag Company. Archived from the original on November 19, 2011. Retrieved December 13, 2011. ↑ "Like glasses for chickens". The Natural Poultry Farming Guide. Retrieved June 26, 2014. ↑ U.S. Patent 730,918, Application: December 10, 1902; issued: June 16, 1903. ↑ "Chicken Specs Prevent Pecks" (Fee required). The Hawk-Eye. November 21, 1973. p. 24. "Glasses offers". ↑ "Invents Goat That Bucks". The Spokane Chronicle. June 22, 1910. p. 20. ↑ "Overview of What's My Line? episode #241". tv.com (CBS Interactive). Archived from the original on November 19, 2011. Retrieved November 17, 2011. ↑ Masterman, Len (1987). Television Mythologies: Stars, Shows and Signs. Routledge. p. 21. ISBN 978-0-203-99443-6. ↑ Mercer, Charles (March 16, 1958). "TV Panel Bares Gamut of Jobs" (Fee required). Big Spring Daily Herald. p. 5-D.
↑ Department of Environment, Food & Rural Affairs (July 2002). "Mutilations" (PDF). Codes of Recommendations for the Welfare of Livestock: Laying Hens: 21. 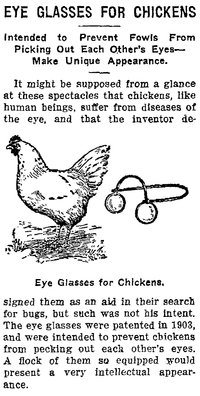 1902 patent: "Eye-protector for chickens"